I don’t care what diet you’re on, no visit to New Orleans is complete without a stop at Cafe Du Monde in the French Quarter for some fresh, hot beignets and coffee. And while they do have indoor seating, it’s almost sacrilegious to succumb to the lure of air conditioning when you could be sitting out on the patio, dripping sweat, while people-watching and listening to the ad-lib free entertainment that’s offered 24/7. On our most recent trip, we were treated to some a capella hymn-singing by this enthusiastic gentleman. He had a decent baritone and an infectious spirit, so we enjoyed his renditions of some old familiar church songs. From a photography standpoint, this was a tricky shot given the wide range of lighting conditions from the shade of the patio to the bright sunlight on the street. The Nikon D700 handled it nicely, shooting in RAW format gave me the data that I needed to recover the details in the shadows, and Topaz plug-ins provided some nice detail recovery. I love this shot because there are so many stories going on at once….the couple buying tickets on the left, the singer, the older couple walking up the ramp, the younger couple lounging on the bench, and the crowd on the patio enjoying the show. One of my favorite images from the day. Click the image to view large!! 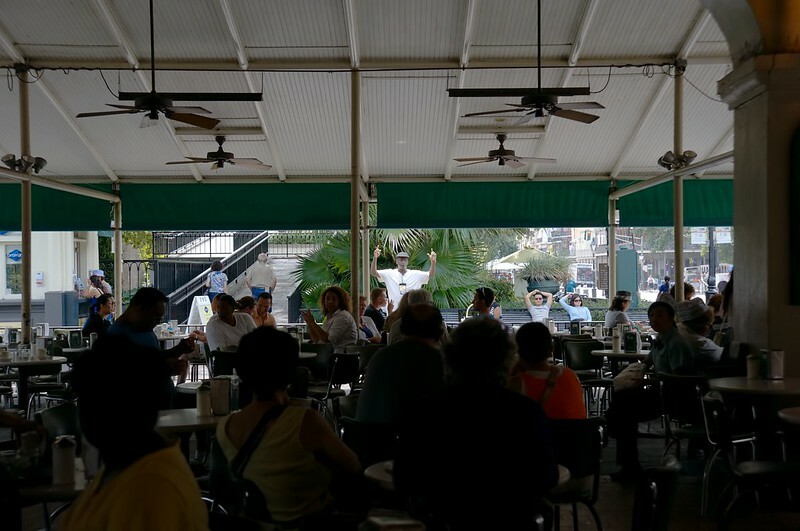 This entry was posted in Information, Shooting and tagged 24-85mm, Cafe Du Monde, D700, entertainer, New Orleans, Nikon, Paintshop Pro, singer, Topaz. Bookmark the permalink.